Point 6 of Deming’s 14 Points. I think it was this point that made me realise that everybody projects their own anxieties onto Deming’s writings and finds what they want to find there. Deming elaborates this point further in Out of the Crisis and several distinct positions emerge. I identify nine. In many ways, the slogan Institute training on the job is no very good description of what Deming was seeking to communicate. Not everything sits well under this heading. “Training”, along with its sagacious uncle, “education” is one of those things that every one can be in favour of. The systems by which the accumulated knowledge of humanity are communicated, criticised and developed are the foundations of civilisation. But like all accepted truths some scrutiny repays the time and effort. Here are the nine topics I identified in Out of the Crisis. This was one of Deming’s targets behind his sixth point. It reiterates a common theme of his. It goes back to the criticisms of Hayes and Abernathy that managers were incapable of understanding their own business. Without such understanding, a manager would lack a narrative to envision the future material rewards of current spending. Cash movements showed on the profit and loss account. The spending became merely an overhead to be attacked so as to enhance the current picture of performance projected by the accounts, the visible figures. I have considered Hayes and Abernathy’s analysis elsewhere. Whatever the conditions of the early 1980s in the US, I think today’s global marketplace is a very different arena. Organisations vie to invest in their people, as this recent Forbes article shows (though the author can’t spell “bellwether”). True, the article confirms that development spending falls in a recession but cash flow and the availability of working capital are real constraints on a business and have to be managed. Once optimism returns, training spend takes off. Getting people to give vast amounts of money when there’s no firm idea what that money will do is like throwing maidens down a well. It’s an appeal to magic. And the results are likely to be as stupid and disappointing as the results of magic usually are. The tragedy of so many corporations is that training budgets are set and value measured on how much money is spent, in the idealistic but sentimental belief that training is an inherent good and that rewards will inevitably flow to those who have faith. The reality is that it is only within a system of rigorous goal deployment that local training objectives can be identified so as to serve corporate strategy. Only then can training be designed to serve those objectives and only then can training’s value be measured. Yet, failure of training can never be the root cause of a problem or defect. Such an assertion yields too readily to the question Why did lack of training cause the failure?. The Why? question exposes that there was something the training was supposed to do. It could be that the root cause is readily identified and training put in place as a solution. But, the question could expose that, whatever the perceived past failures in training, the root cause, that the training would have purportedly addressed, remains obscure. Forget worrying about training until the root cause is identified within the system. In any event, training will seldom be the best way of eliminating a problem. Redesign of the system will always be the first thing to consider. Uncontroversial but I think Deming overstated businesses’ failure to appreciate this. So much of Deming’s approach was about rigorous criticism of business data and the diligent separation of signal and noise. Those are topics that certainly have greater salience than a quarter of a century ago. Nate Silver has done much to awaken appetites for statistical thinking and the Six Sigma discipline has alerted the many to the wealth of available tools and techniques. Despite that, I am unpersuaded that genuine statistical literacy and numeracy (both are important) are any more common now than in the days of the first IBM PC. Deming’s banner headline here is Institute training on the job. I think the point sits uncomfortably. I would have imagined that it is business schools and not employers who should apply their energies to developing and promoting quantitative skills in executives. One of the distractions that has beset industrial statistics is its propensity to create a variety of vernacular approaches with conflicting vocabularies and competing champion priorities: Taguchi methods, Six Sigma, SPC, Shainin, … . The situation is aggravated by the differential enthusiasms between corporations for the individual brands. Even within a single strand such as Six Sigma there is a frustrating variety of nomenclature, content and emphasis. It’s not training on the job that’s needed. It is the academic industry here that is failing to provide what business needs. Of this I remain unpersuaded. I do not believe that people learn to drive motor cars in different ways. It can’t be done from theory alone. It can’t be done by writing a song about it. it comes from a subtle interaction of experience and direction. Some people learn without the direction, perhaps because they watch Nelly (see below). Many have found a resonance between Deming’s point and the Theory of Multiple Intelligences. I fear this has distracted from some of the important themes in business education. As far as I can see, the theory has no real empirical support. Professor John White of the University of London, Institute of Education has firmly debunked the idea (Howard Gardner : the myth of Multiple Intelligences). After my academic and vocational training as a lawyer, I followed a senior barrister around for six months, then slightly less closely for another six months. I also went to court and sat behind barristers in their first few years of practice so that I could smell what I would be doing a few months later. It was important. So was the academic study and so was the classroom vocational training. It comes back to understanding how the training is supposed to achieve its objectives and designing learning from that standpoint. This is tremendously dangerous advice for anybody lacking statistical literacy and numeracy (both). I will come back to this but it embraces some of my earlier postings on process discipline. This is the gem. Employee engagement is a popular concern. Employees who have no sight of how their job impacts the customer, who pays their wages, will soon see the process discipline that is essential to operational excellence as arbitrary and vexatious. Their mindfulness and diligence cannot but be affected by the expectation that they can operate in a cognitive vacuum. Walter Shewhart famously observed that Data have no meaning apart from their context. By extension, continual re-orientation to the Voice of the Customer gives meaning to structure, process and procedure on the shop floor; it resolves ambiguity as to method in favour of the end-user; it fosters extrinsic, rather than intrinsic, motivation; and it sets the external standard by which conduct and alignment to the business will be judged and governed. A few months ago my wife ordered a hole punch from Amazon one evening. It cost £5.49. The following morning at 8.00 there was a knock at the door. The hole punch was delivered. That really is as much as I know for a fact about Amazon’s business processes. I was, therefore, shaken by an item on BBC News alleging Amazon workers face ‘increased risk of mental illness’. I don’t think the quotes make that anything other than an alarming headline. The item trailed a BBC documentary The Truth Behind The Click. UK readers can see the documentary here on BBC iPlayer. I thought that I would wait until I watched the documentary before I commented. Having now watched it, I think it is difficult to draw any conclusions from the programme. Its tone was so plainly tendentious. The BBC had sent a covert reporter with a video camera into an Amazon warehouse, he having misrepresented himself as a job seeker. Some of the video, taken from the perspective of an Amazon employee picking in a warehouse, looked to me as though it was shown speeded up. The characteristics of this type of job, the evidence shows, increase the risk of mental illness and physical illness. Sadly there is no analysis. We were not told what characteristics, what the supposed levels of safety or what the supporting evidence. There was no quantitative data drawn from more than one individual. Part of the problem with the programme was, I think, that three principle issues have been conflated here. The general nature of repetitive manual work. The psychological impact of working to an externally set “drum beat”. The physical and cognitive effects of working at a particular rate. Repetitive work has always been with us. Some people find in it dignity and liberation. The Buddhist practice of samu, repetitive physical work performed with mindfulness, is part of Zen spiritual dicipline and the quest for enlightenment. Conversely, socialist pioneer William Morris believed that we should all be composing epic poems in our heads while sat weaving at the loom. That being said, such work is not for everybody. I got the impression that Amazon were fairly clear to new employees as to what was involved. This is where recruitment is a key business process, identifying people who will fit with this type of role and stick with it. However, I see nothing in general sinister about such work. What delivered that hole punch so quickly was the “drum beat” that regulates work along the supply chain. This is a fundamental part of the Toyota Production System and lean operations generally. The takt time specifies the rate at which products are being despatched to customers. That sets the rate at which pickers need to work. If the pickers work too quickly then packages build up in front of the despatch area. If too slowly, the despatch area stands idle. Both entail cost or delay that has to be passed on to the customer. The customer suffers. The programme interviewed workers who felt the “drum beat”, announced through the bleep on a hand held electronic scanner, dehumanising. The BBC journalist clearly shared their view. The workers felt this deprived them of autonomy. They felt that they were not encouraged to think of [them]selves as human beings. We do not show enough respect for boring work. We tend to sentimentalise and even glamorise the sort of active participation in work that too often results from having to resolve a non-conformance, a defect, a delay or an emergency. That is not useful work, no matter how much satisfaction it offers the employee. I sometime sense a bien pensant nostalgia for the days when millions were employed in repetitive tasks on piece work. I think the BBC especially self indulgent on this matter. Piece work of course incentivises a worker to produce as much as they can even if that increases costs to the company in storing it until it can be used, if it ever is. The benefit of the drum is that the worker is required to produce no more or less than society needs. The laudable aim of lean operations is to reduce waste, Toyota use the Japanese term muda. What I think was missing at Amazon was engagement of all employees in improvement. The usual quid pro quo for diligently following the drum is that part of the day is spent off-line in improvement work where an employee can, if so inclined, exercise their ingenuity. However, I am aware that the BBC reporter was recruited for the Christmas rush. That is not a period that anybody devotes to improvement work. Production is king. Improvement should have been prioritised earlier in the year when volumes were slow. I think though that there is still an opportunity for a periodic review of the voice of the customer with all staff. It is focus on the customer that ultimately legitimises and justifies the discipline. I think Amazon staff would appreciate being reminded of just how quickly their orders are getting to customers, the variety of desires satisfied so promptly and the volume of transactions despatched, all through their discipline and focus on the drum. Perhaps Amazon do this but the reporter didn’t stick around long enough to hear. This is the toughest part of the allegations to analyse. Was the takt time just set too quick for human capability? There is probably some flexibility in setting the rate for any individual as capacity can be increased by employing more pickers. There must be some limit on the number of pickers as the warehouse aisles will only accommodate so many on the move. However, as I said above, I found the overall tone of the programme so tendentious that I cannot take its criticisms at face value. No analysis by Professor Marmot was presented. Amazon have serious legal obligations to provide their workers with a safe system of work and to carry out health surveillance. Amazon have to cope with the real costs of absenteeism, staff turnover and litigation. I would be surprised if they had not analysed work demands thoroughly and diligently. I do confess to feeling uncomfortable at the practice of terminating employment on the third consecutive day’s sick leave but, ultimately, it is a matter for Amazon. I think that my conclusion from watching the programme is that it is critical to maintain all employees’ extrinsic motivation by the voice of the customer through constant review and emphasis of how an individual’s discipline contributes to the overall market impact. Goal deployment helps. Beyond that, I’m not persuaded by the BBC’s criticism. Last weekend I was reading Dominic Lawson’s Sunday Times (London) review (10 November 2013) of Normal Greenspan’s recent book The Map and the Territory: Risk, Human Nature, and the Future of Forecasting. Lawson expresses his astonishment at what Greenspan says. I and other economic forecasters didn’t understand that markets are prone to wild and even deranging mood swings that are uncoupled from any underlying rational basis. I have to share Lawson’s astonishment. After all, Greenspan was the man who criticised the markets’ irrational exuberance back in the 1990s. Lawson usefully reminded me of an important observation by eighteenth century philosopher David Hume. Reason is … only the slave of the passions and can never pretend to any other office. Perhaps computer pioneer Marvin Minksy put it in a more colloquial way. Logic doesn’t apply in the real world. That is something that we have to be very wary of in the management of an enterprise. Whatever the consensual mission, it is ultimately under threat from narrow decisions by individuals, or self-reinforcing groups, that might be influenced more by emotional reactions to local events than by an appreciation of the organisational system. I think that there are some things leaders can do to minimise the risks. Firstly, put key measures on a process behaviour chart and run it continuously. This provides a focus for discussion, for testing opinions and for placing decision making in context. Secondly, formalise periodic reviews of process capability accompanied by a reappraisal of, and immersion in, the voice of the customer. Communicate this review widely. Do not allow it to be ignored or minimised in any discussions or decision processes. Thirdly, just be aware of the risks that decisions might be emotionally founded with only post hoc rationalisation. Keep an eye on people who chronically avoid engagement in the process behaviour chart and capability study. Be mindful of your own internal thought processes. They are certainly less rational than you think. I think that with those precautions organisations can harness the positive emotions that generate enthusiasm for a product or process and passion for its continual improvement. Richard Dawkins has recently had a couple of bad customer experiences. In each he was confronted with a system that seemed to him indifferent to his customer feedback. I sympathise with him on one matter but not the other. The two incidents do, in my mind, elucidate some important features of process discipline. In the first, Dawkins spent a frustrating spell ordering a statement from his bank over the internet. He wanted to tell the bank about his experience and offer some suggestions for improvement, but he couldn’t find any means of channelling and communicating his feedback. Embedding a business process in software will impose a rigid discipline on its operation. However, process discipline is not the same thing as process petrification. The design assumptions of any process include, or should include, the predicted range and variety of situations that the process is anticipated to encounter. We know that the bounded rationality of the designers will blind them to some of the situations that the process will subsequently confront in real world operation. There is no shame in that but the necessary adjunct is that, while the process is operated diligently as designed, data is accumulated on its performance and, in particular, on the customer’s experience. Once an economically opportune moment arrives (I have glossed over quote a bit there) the data can be reviewed, design assumptions challenged and redesign evaluated. Following redesign the process then embarks on another period of boring operation. The “boring” bit is essential to success. Perhaps I should say “mindful” rather than “boring” though I fear that does not really work with software. Dawkins’ bank have missed an opportunity to listen to the voice of the customer. That weakens their competitive position. Ignorance cannot promote competitiveness. Any organisation that is not continually improving every process for planning, production and service (pace W Edwards Deming) faces the inevitable fact that its competitors will ultimately make such products and services obsolete. As Dawkins himself would appreciate, survival is not compulsory. Dawkins’ second complaint was that security guards at a UK airport would not allow him to take a small jar of honey onto his flight because of a prohibition on liquids in the passenger cabin. Dawkins felt that the security guard should have displayed “common sense” and allowed it on board contrary to the black letter of the regulations. Dawkins protests against “rule-happy officials” and “bureaucratically imposed vexation”. Dawkins displays another failure of trust in bureaucracy. He simply would not believe that other people had studied the matter and come to a settled conclusion to protect his safety. It can hardly have been for the airport’s convenience. Dawkins was more persuaded by something he had read on the internet. He fell into the trap of thinking that What you see is all there is. I fear that Dawkins betrays his affinities with the cyclist on the railway crossing. When we give somebody a process to operate we legitimately expect them to do so diligently and with self discipline. The risk of an operator departing from, adjusting or amending a process on the basis of novel local information is that, within the scope of the resources they have for taking that decision, there is no way of reliably incorporating the totality of assumptions and data on which the process design was predicated. Even were all the data available, when Dawkins talks of “common sense” he was demanding what Daniel Kahneman called System 2 thinking. Whenever we demand System 2 thinking ex tempore we are more likely to get System 1 and it is unlikely to perform effectively. The rationality of an individual operator in that moment is almost certainly more tightly bounded than that of the process designers. In this particular case, any susceptibility of a security guard to depart from process would be exactly the behaviour that a terrorist might seek to exploit once aware of it. Further, departures from process will have effects on the organisational system, upstream, downstream and collateral. Those related processes themselves rely on the operator’s predictable compliance. The consequence of ill discipline can be far reaching and unanticipated. That is not to say that the security process was beyond improvement. In an effective process-oriented organisation, operating the process would be only one part of the security guard’s job. Part of the bargain for agreeing to the boring/ mindful diligent operation of the process is that part of work time is spent improving the process. That is something done offline, with colleagues, with the input of other parts of the organisation and with recognition of all the data including the voice of the customer. Had he exercised the “common sense” Dawkins demanded, the security guard would have risked disciplinary action by his employers for serious misconduct. To some people, threats of sanctions appear at odds with engendering trust in an organisation’s process design and decision making. However, when we tell operators that something is important then fail to sanction others who ignore the process, we undermine the basis of the bond of trust with those that accepted our word and complied. Trust in the bureaucracy and sanctions for non-compliance are complementary elements of fostering process discipline. Both are essential. This is a shocking video. It shows a cyclist wholly disregarding warnings and safety barriers at a railway crossing in the UK. She evaded death, and the possible derailment of the train, by the thinnest of margins imaginable. In my mind this raises fundamental questions, not only about risk perception, but also about how we can expect individuals to behave in systems not of their own designing. Such systems, of course, include organisations. I was always intrigued by John Adams’ anthropological taxonomy of attitudes to risk (taken from his 1995 book Risk). Adams identifies four attitudes to risk found at large. Each is entirely self-consistent within its own terms. 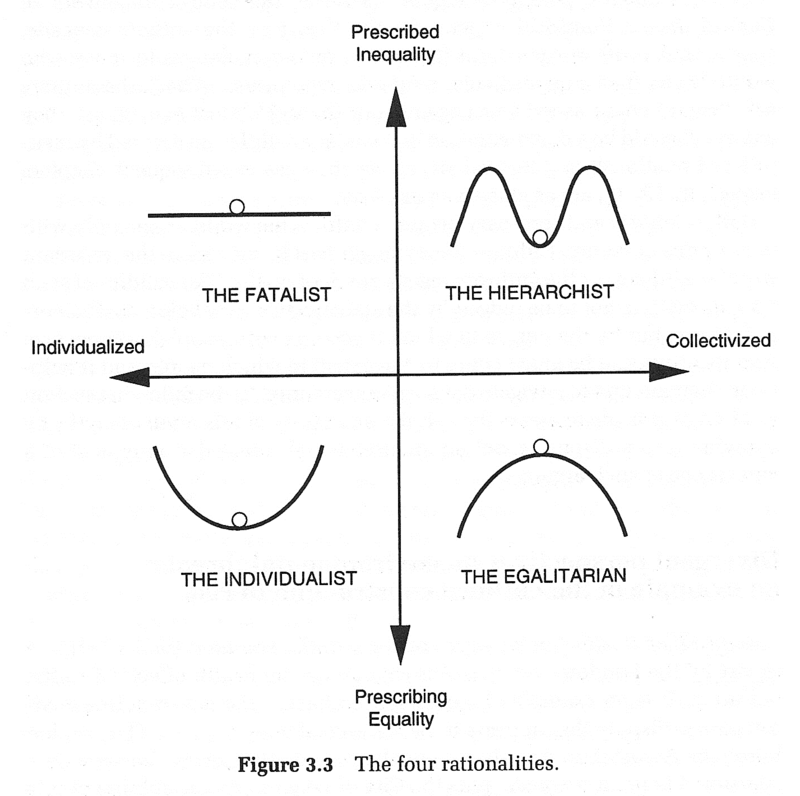 The egalitarian believes that human and natural systems inhabit a precarious equilibrium. Any departure from the sensitive balance will propel the system towards catastrophe. However, the individualist believes the converse, that systems are in general self-correcting. Any disturbance away from repose will be self-limiting and the system will adjust itself back to equilibrium. The hierarchist agrees with the individualist up to a point but only so long as any disturbance remains within scientifically drawn limits. Outside that lies catastrophe. The fatalist believes that outcomes are inherently uncontrollable and indifferent to individual ambition. Worrying about outcomes is not the right criterion for deciding behaviour. Without an opportunity to interview the cyclist it is difficult to analyse what she was up to. Even then, I think that it would be difficult for her recollection to escape distortion by some post hoc and post-traumatic rationalisation. I think Adams provides some key insights but there is a whole ecology of thoughts that might be interacting here. Was the cyclist a fatalist resigned to the belief that no matter how she behaved on the road injury, should it come, would be capricious and arbitrary? Time and chance happeneth to them all. Was she an individualist confident that the crossing had been designed with her safety assured and that no mindfulness on her part was essential to its effectiveness? That would be consistent with Adams’ theory of risk homeostasis. Whenever a process is made safer on our behalf, we have a tendency to increase our own risk-taking so that the overall risk is the same as before. Adams cites the example of seatbelts in motor cars leading to more aggressive driving. Accidents do not occur because people gamble and lose, they occur because people do not believe that the accident that is about to occur is at all possible. Why did the cyclist not trust that the bells, flashing lights and barriers had been provided for her own safety by people who had thought about this a lot? The key word here is “trust” and I have blogged about that elsewhere. I feel that there is an emerging theme of trust in bureaucracy. Engineers are not used to mistrust, other than from accountants. I fear that we sometimes assume too easily that anti-establishment instincts are constrained by the instinct for self preservation. However we analyse it, the cyclist suffered from a near fatal failure of imagination. Imagination is central to risk management, the richer the spectrum of futures anticipated, the more effectively risk management can be designed into a business system. To the extent that our imagination is limited, we are hostage to our agility in responding to signals in the data. That is what the cyclist discovered when she belatedly spotted the train. Economist G L S Shackle made this point repeatedly, especially in his last book Imagination and the Nature of Choice (1979). Risk management is about getting better at imagining future scenarios but still being able to spot when an unanticipated scenario has emerged, and being excellent at responding efficiently and timeously. That is the big picture of risk identification and risk awareness. That then leads to the question of how we manage the risks we can see. A fundamental question for any organisation is what sort of risk takers inhabit their ranks? Risk taking is integral to pursuing an enterprise. Each organisation has its own risk profile. It is critical that individual decision makers are aligned to that. Some will have an instinctive affinity for the corporate philosophy. Others can be aligned through regulation, training and leadership. Some others will not respond to guidance. It is the latter category who must only be placed in positions where the organisation knows that it can benefit from their personal risk appetite. If you think this an isolated incident and that the cyclist doesn’t work for you, you can see more railway crossing incidents here. The other day I came across a report on the BBC website that non-expert listeners could pick out winners of piano competitions more reliably when presented with silent performance videos than when exposed to sound alone. In the latter case they performed no better than chance. The report was based on the work of Chia-Jung Tsay at University College London, in a paper entitled Sight over sound in the judgment of music performance. The news report immediately leads us to suspect that the expert evaluating a musical performance is not in fact analysing and weighing auditory complexity and aesthetics but instead falling under the subliminal influence of the proxy data of the artist’s demeanour and theatrics. That is perhaps unsurprising. We want to believe, as does the expert critic, that performance evaluation is a reflective, analytical and holistic enterprise, demanding decades of exposure to subtle shades of interpretation and developing skills of discrimination by engagement with the ascendant generation of experts. This is what Daniel Kahneman calls a System 2 task. However, a wealth of psychological study shows only too well that System 2 is easily fatigued and distracted. When we believe we are thinking in System 2, we are all too often loafing in System 1 and using simplistic learned heuristics as a substitute. It is easy to imagine that the visual proxy data might be such a heuristic, a ready reckoner that provides a plausible result in a wide variety of commonly encountered situations. The problem is that what Kahneman describes is exactly what I was doing in finding my biases confirmed by this press report. I have had a superficial look at the statistics in this study and I am now less persuaded than when I read the press item. I shall maybe blog about this later and the difficulties I had in interpreting the analysis. Really, this is quite a tentative and suggestive study on a very limited frame. I would certainly like to see more inter-laboratory studies in psychology. The study is open to multiple interpretations and any individual will probably have difficulty making an exhaustive list. There is always a danger of falling into the trap of What You See Is All There Is (WYSIATI). That notwithstanding, even anecdotally, the story is another reminder of an important lesson of process management that, even though what we have been doing has worked in the past, we may not understand what it is that has been working.